An elderly woman was left shaken after an intruder entered her bedroom on Saturday evening. The incident happened at 9:30pm in a house in Messines Park in Londonderry. The incident occurred over the weekend. The woman, who lives alone, was left shaken and upset, but she was uninjured and nothing was taken. Elsewhere, between 5.30pm on Saturday and 1:00am on Sunday, a burglary took place in the Farmhill area of the city. Some cash and jewellery were taken, the elderly occupants were not present. The PSNI is treating both incidents as linked and detectives would appeal for for any witnesses to come forward by ringing 101, alternatively info can be provided to the independent charity, Crimestoppers, on 0800 555 111, which is 100% anonymous and gives you the power to speak up and stop crime. 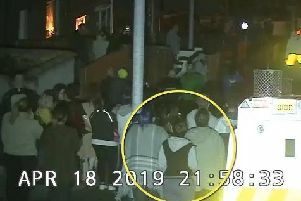 "I would appeal to anyone with elderly or vulnerable neighbours to check on them and ensure all windows and doors are locked and we can all try to keep everyone safe," wrote the PSNI on Facebook.